A crusty baguette tastes best when eaten within a few hours of baking and goes stale quite quickly due to its small size. In addition to a lack of flavor, stale baguettes becomes rock hard and difficult to chew due to a process called retrogradation. The good news is you can soften and revive a stale baguette, making it taste almost like fresh bread. The baguette will turn stale quickly, so wait to revive it until just before you plan to eat it. You can only revive a baguette one time, so try to use up the softened baguette quickly. Moisten the baguette with an ice cube or cold, running water, making a quick pass under the water so the bread is moist but not soaked. Wrap the baguette with aluminum foil, tightly sealing all seams to trap in steam. Set the foil-wrapped baguette on your oven's center rack. Set the temperature to 300 degrees Fahrenheit. Do not place the loaf on a pan and do not preheat the oven. Bake the baguette for about 15 minutes. Unwrap the baguette and press it with your fingers to check for softness. You can eat it at this stage or place it back on the rack for another 5 minutes if you want a slightly crispy crust typical of fresh baguettes. Dip a clean, lint-free dish towel in cold water. Wring out all excess water so the rag is damp, but not wet. Roll up the baguette in the towel, folding over all the edges so all the bread is fully encased. Place the wrapped baguette in the microwave and heat for about 30 seconds on the high setting. Unroll the baguette and check it for softness. If the bread still feels hard and stale, wrap it back in the towel and microwave it at 10-second intervals until soft. 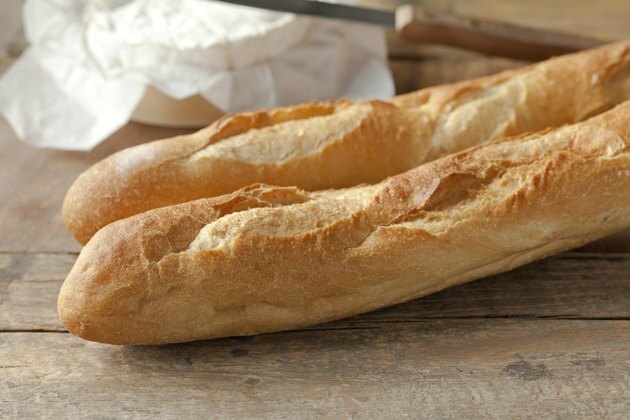 Microwave ovens vary greatly, but it shouldn't take more than 1 minute total to completely soften the baguette. If you can't eat the rest of the baguette after reviving it, the leftovers can be cut into cubes and toasted to make croutons.